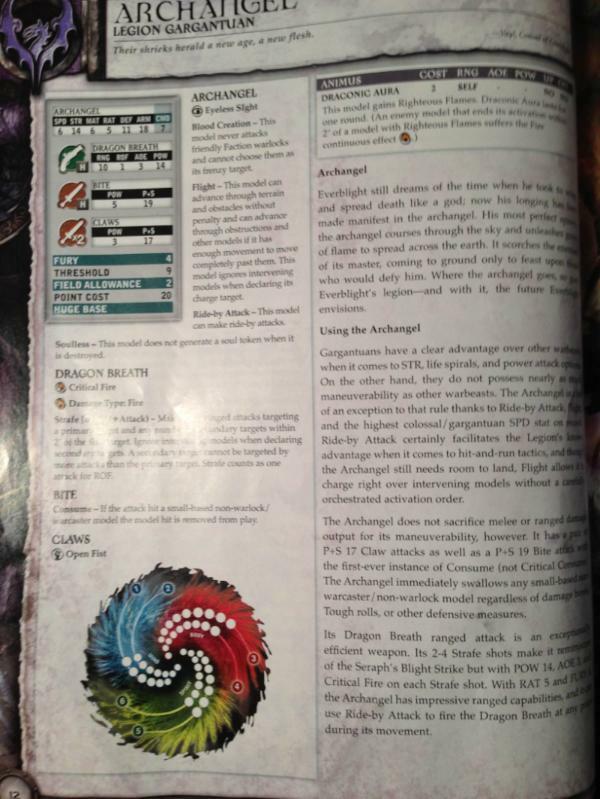 The stats were previewed in the No Quarter this month and the actual page with them was leaked today. I'm sorry to say, the stats in the NQ were pretty much exactly the leaked stats. Take a look. That's pretty much 100% Glass cannon. It will hit like a truck, but it will not take a beating. Even with Abbys buffs and tenacity, it's still pretty vulnerable to hard hitters. The only cool thing that I didn't notice before is that you can make a ride by attack, shoot and then scoot back to relative safety. If they are shooting at your colossal, then you are probably ok.
Consume on the bite is almost 100% useless. The only benefit is against tough small bases. woo. The animus is never going to be used. I wish it was anything else. What do you guys think? Impressed? Under-whelmed? Why? I think it's too many points for what you get, personally. To BAO or not to BAO?